At last it has happened. Niseko-Hirafu Resort has bestowed on powder seekers the right to ride out of bounds without fear of pass-loss. Take your pick: Strawberries, Tetsu's, Roy's trees, the Peak run... they are now all open and waiting to be enjoyed without guilt or fear. Gone are the days of powdery espionage. No more games of cat and mouse, playing hide and seek with ski patrol. Under pressure from the growing number of powder converts, Niseko-Hirafu management has introduced a "Niseko Local Rules" system to open up the resort's wonderful off-piste area. Until now, straying under ropes and away from marked trails has been forbidden. We have been lucky that, in practice, Hirafu patrollers have tended to turn a blind eye to rope ducking. But frustratingly, depending on timing or perhaps on the mood of the patroller that day, powder seekers have been denied access - made to return to groomed runs, or worse, had their lift passes confiscated. Until this season Niseko resort management has been stuck in a state of off-piste denial. The official policy has been that no one will sky anywhere except within resort limits. Much of the blame for this unrealistic approach lies in Japanese Forestry Department legislation. 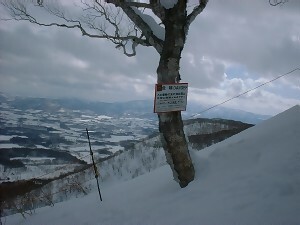 Because the mountain is classified as natural forest, the companies running resorts need special permission to operate. They are under strict instructions to keep customers inside allocated run areas. Not withstanding National park legislation, the person who could have explained the tracks coming down from the peak on a sunny day deserves a free season pass and a career in politics. Looking the other way may have worked in the days when people preferred groomed runs, but more Japanese skiers and boarders prefer to slash it up in powder, than practice their carving on the hard stuff. In any Japanese snow-related magazine, feature after feature will focus on skiing powder, backcountry adventure or avalanche awareness. In Niseko the number of people carrying backpacks and snowshoes has increased remarkably. Some of this gear may be simply a fashion statement, but the majority of these people represent a new generation of backcountry troopers. Rain or shine they are out there searching for powder. In addition, Niseko-Hirafu has seen a huge increase in powder hungry Western skiers and boarders. At times it seems that half the shrieks of joy come with English accents. To ignore the demands of today's powder-crazed public is impossible. It is also a recipe for disaster. Imagine one hundred people happily traversing under the East Face cornice when it slides... The resort is faced with a difficult task - trying to give holidaymakers their powder fix, yet maintaining standards of safety. Various governmental bodies have complicated the job by banning the use of avalanche-control bombing. Furthermore, it appears that the resort does not have adequate manpower to carry out out of bounds safety control. Niseko's backcountry is just too vast to ensure customer safety. In an initial endeavour to keep everyone happy and safe, certain "Local Rules" have been put in place. 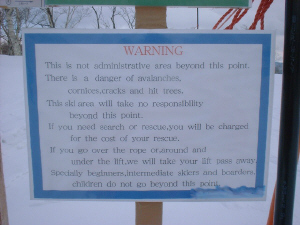 The resort's policy is basically that now if you ski off-piste, they won't be responsible for your safety. To get this message across signs have been set up in front of most prominent lifts, and at the entrance to popular areas like Strawberry Fields. Areas off skiing ground courses are "areas outside skiing ground control." Skiing ground administrators assume no responsibility for accidents that may occur in these areas. Entering areas beyond Keep Out ropes, nets and bamboo poles is strictly prohibited as there is danger of avalanches in areas off skiing ground courses. In particular, avalanches take place frequently in the red areas indicated in the following figure. As mountains are particularly dangerous in winter, you will be held entirely responsible for your own actions. Avalanche beacons among other devices help expedite search activities when accidents occur. Please be aware that even in these instances, most skiers and snowboarders are found dead. 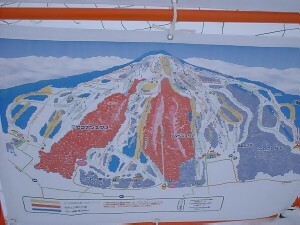 Those who enter the red areas in the figure below, where avalanche-related accidents frequently occur, will have their lift coupons confiscated and their use of lift during the season will be denied. 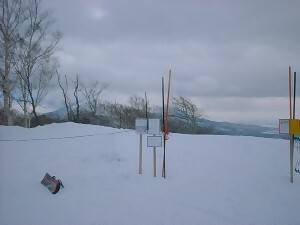 Skiing grounds at all Niseko mountains have numerous courses where you can enjoy non-packed off-piste snow, as described in the figure below. Confirm avalanche information at each skiing ground. 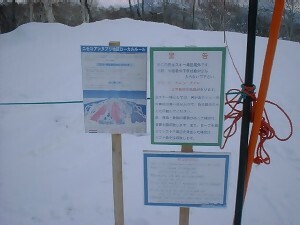 These local rules were determined by the Niseko Free Passport Council and the Niseko Annupuri District Avalanche Prevention Countermeasure Council. 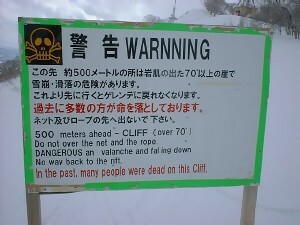 With the freeing-up of off-piste areas in Niseko there have also been some sacrifices. One of the conditions of "Local Rules" is that no one is to ride in "Haru-no Taki" (the cliffs next to Alpen), Mizuno-no Sawa (the valley in Higashiyama), and in Mikaeri Sawa (the valley on the Annupuri side of Niseko). All these areas offer great terrain, but they are high risk avalanche zones where people have lost their lives. This is especially so with Haru-no Taki, which for years has been a popular area with locals. Thirty metre plus cliffs and regular slides have prompted management to close the area to everyone this season. However, there is mention of opening Haru-no Taki in the future, possibly with a 'beacon check-point station' in place. Niseko Local Rules demand common sense from all. Read the daily avalanche reports and consider what is happening in the terrain above as well as below you. Remember that these areas have not been bombed, and that there are other people enjoying the powder who have little backcountry experience. The new local rules system provides gates of entry into off-piste areas. It does not give anyone the authority to duck ropes within resort limits. Consideration should go to the ski patrollers - they are the ones who are called in rescue situations. At this point there have been no backcountry fatalities for season 2002. With this perfect record, the local rules system will probably continue and expand. Even more powder territory should then become accessible.